My Very First Blog: Are You Horn Happy? Traffic jams. Don’t you just hate them? What do you do when you are trapped in a traffic jam? Listen to the radio? Practise your singing? Play Sudoku? Read the latest novel? Sms your friends? Call someone on your phone? Or just sit there in your car and sulk? During a massive jam when your car move an inch a minute, don’t you just wish your car have wings and fly? Or call Scotty to beam you up? During the Ramadan last month, I was trapped in massive jam as early as 4pm. Normally I would stay off the road during those peak rushing home hours between 5-7pm. But it was different during Ramadan. The jam came as early as 4pm. And it irritated the hell out of me! I think my car ended up using more petrol during that month. What do you expect when you need to stop your car every other minute? When Hari Raya day arrived, it was great relief to me. Finally, I’ve got the whole road to myself! How nice! Unfortunately, it didn’t stay that way for long. The jam came right back after the Raya holidays. To make things worse for us drivers, we are forced to face with rude and unreasonable drivers who think either they or their fathers own the road. Only the other day, I was driving happily on my lane, when a motorbike suddenly cut into my lane from nowhere causing me to jam hard on the brakes. But guess what? Instead of me showing him the fingers, he showed me his fingers instead! Can you believe it? At that moment, I felt like running him down! But I kept my cool because I’m generally a nice person. And I did not want to spend the next few years in jail. Well you know, they don’t serve clean, delicious food in there! Drivers in KL also have this fondness of using their horns at every opportunity. The traffic light turns green and you better get moving that very second it turns green or you get honked. The traffic light turns yellow and you better beat the light or else you get honked. The traffic light turns red and you slowly cruise to a stop. Unfortunately, the impatient driver behind honks you because he wants to stop in front of the red light in the shortest time possible. Although KL has heavy traffic and suffers from traffic jam most of the time, it is not as bad as the traffic jams in Bangkok, Thailand. 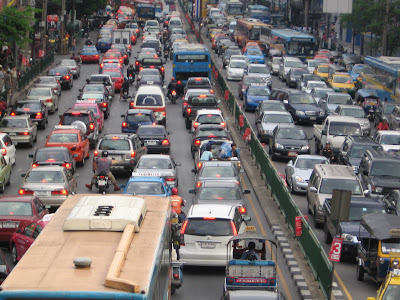 I remember the last time I went to Bangkok the traffic jam there was much worse. Surprisingly, despite having more traffic, I hardly hear any driver in Bangkok sounding their horns! Looks like drivers in Bangkok have better manners and not horn-happy unlike their Malaysian counterparts. Shame on you, Malaysia! Our traffic jam is the lesser of 2 evils when compared to Bangkok. Nevertheless, some Malaysians never learn etiquette when driving. I believe our traffic and driver manners may pale in comparison to what I have seen and heard in Cairo, Egypt. Seemed like the honking goes along with the driving...it never stops. Everywhere they move, the honking is heard...I was stumped when I first experienced this in Cairo. I don't wanna driver there..scary! Generally drivers here are a bit impatient but not really to the extreme like some other parts of the world where they honk more than they press the brakes. Malaysian drivers are quite rude as always - showing rude signs, cursing in the vehicle and not signalling. Driving can really show a person's true character! Crazy Malaysian drivers. The bikers are worst, need to be sent to Tanjong Rambutan! maybe u should have a bumper sticker that says "horn if u r horny." oops. anyway ... there's always human traffic if u decided to skip road traffic. I always ask Zaini why he didn't honk people who likes to cut his way but he said that no pint of pressing the horn in Malaysia since nobody bothers anyway. Reminds me of my encounter yesterday. There's this old man riding on a bicycle in the middle of the road which I wanted to turn in. Naturally I let him pass first before turning. The car at the back honked me. I was like, "Wtf, got ah pek leh, want me bang him meh?" But I just ignored and waited for the old man to pass. It's a sin to knock and kill an old soul like that... LOL. gallivanter, I think Malaysians somehow become different people when they get into the driver's seat. my bug life, I've never been to Cairo. It must be really stressful driving there. Or maybe you'll be so used to it you'll just ignore the horns! eiling, yes I agree. Driving can show a person's true character. So if you want to really know someone, ask him or her to drive! Haha! pete, yes I think bikers should be banned from the road! They are too much of a danger to car drivers. Sometimes they just weave in and out of traffic in high speed not caring for their own safety. I seriously think bikers and car drivers should be on separate roads. Btw, I tried to leave a comment on your blog, but failed every time. What's wrong? lina, oh I absolute hate it when motorists turn a 2 lane road into 3 or 4 lanes! We really have that talent, don't we? But I also hate some roads that is actually a 2 lane road but becomes 1 lane towards the end. Then you end up with a bottleneck jam! I won't even begin to tell you the amount of times I wanted to run down some moronic motorcyclist! They really think the roads belong to them and they can do no wrong! And I normally fantasize that I've just inherited a billion US dollars, that normally help the traffic move along pretty fast ... LOL! I hardly ever use...and the last time I had to use it to let someone know I was at her house liao, it gave out a funny sound like a fart! LOL!!! Haven't taken it for repairs yet! That sound would probably work better...in getting people out of the way. Yes yes. That's what I do actually. I always observe the way people drive then I assess their characters! some malaysian drivers can be notoriously impatient and rude. Driving in Malaysia especially KL is very stressful. Imagine getting caught during rush hour, it's raining heavily & somebody's car broke down in the middle of the road. Nightmare! eiling, so I know now. haha! acura, I hate to imagine that scenario! Makes me want to stay away from the road! yes, I hate traffic jams & I wish my car can fly!! LOL!!! That reminds me of Manila, too loud and congested. I used to drive there but I wouldn't dare drive whenever I visit. The drivers are like maniacs. There is hardly any congestion where I live now unless I go to Boston but it's not as bad as Los Angeles,California. Aiyo... I hate traffic jams! oh my look at that traffic! BTW-I just passed on an award to you. PS: Thank you so much for the kindly comment on my site, have a nice day! Before long, the world will be one huge traffic jam. Then if you want to go from here to there, you'll have to walk on top of the other cars! Malaysians are generally less civilized than Thai. But there is a mall group like you and me which are belong to the civilized category, haha! jam, haha, yes. We are the minority civilised Malaysians. lots of traffic here... nice shot. that is the same thing a friend from bkk mentioned! lol.